Note: This post is by Varyonic, not the ActiveAdmin organization. So after nearly seven years Active Admin 1.0 is out. It has been a long and sometimes uncertain journey of which I have witnessed only part. The original author has moved on, subsequent maintainers have burned out, changed jobs, started families… The bug list remains longer than we would like, the features list remains longer than we can handle, but Active Admin has been in production use for years at companies, NGOs and agencies, and there is commitment to keeping the project alive through quiet pragmatism rather than grand plans. Not all of us have the time, money, or even need for the next shiny thing, and even if Active Admin sometimes cuts across ‘the Rails Way’ it can be a significantly productive tool. I encourage you to give it a try, to upgrade if you are already using it, to give us feedback if you find issues. General help is available on StackOverflow (tag #activeadmin); search the GitHub issues, both open and closed (~5,000 in total), before submitting anything new. If you are using Active Admin regularly consider looking through the code, issues and the commit log, maybe you will be inspired to contribute, even if just documentation or translations. If you are working for an agency with multiple customers you may be able to provide valuable insight and encourage adoption. So thank you to all 500+ contributors so far and especially Timo for the past couple of years, here’s to the next 1M downloads. A dogfight is evolving for developer cloud tools. The dominant player recently has been GitHub, raising $400M… GitHub achieved developer mindshare by giving away free hosting to open source projects such as Rails. A close follower of GitHub has been Atlassian, a strong enterprise tools vendor with products such as JIRA, that bought BitBucket and offered free private git hosting. Atlassian went public end of 2015. Other startups in this space that were popular a few years ago but have lagged include Unfuddle and CodebaseHQ. More recently GitLab attended Y-Combinator and gained funding, building on an open source UI with many of the features of GitHub. Large public cloud (IaaS/PaaS) vendors are now increasingly encroaching on this space. Why? Because the trend towards dev-ops and infrastructure as code is bringing developers more and more into the realm of infrastructure management. Projects like Docker are driving increasing commoditization of cloud infrastructure. To create and capture value IaaS/PaaS vendors need to gain and hold developer mindshare by offering more and better tools. Amazon AWS has added CodeCommit. AWS’s strongest competitor, Microsoft Azure offers hosted Visual Studio with free private git hosting and kanban boards for small teams, an attractive option to developers already used to Microsoft’s ecosystem. Similarly, IBM has Bluemix DevOps Services, f.k.a. JazzHub that includes Rational Team Concert. Google has now added Source Repositories that sync with GitHub and BitBucket and include a browser based source editor. Meanwhile innovation in the developer tools space has shifted from repository hosting and issue tracking to continuous integration, cloud IDEs and developer chat. CI startups include Travis CI, Circle CI and CodeShip, which recently raised a $7M series A. Atlassian BitBucket recently added CI pipelines. AWS has added CodePipeline/CodeDeploy for CI/CD. 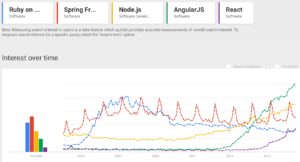 In the cloud IDE space the strongest player appears currently CodeEnvy (IBM?). AWS has acquired Cloud9 (interestingly Atlassian was an early investor and customer) and GitLab has announced a collaboration with Koding. Chat has been getting lots of attention recently because of Slack. Atlassian acquired HipChat. GitLabs partnered with Mattermost. Gitter? Microsoft has Skype for Business. Given the forces at work more consolidation seems likely. Will Atlassian and GitHub remain independent from AWS, Google or IBM? 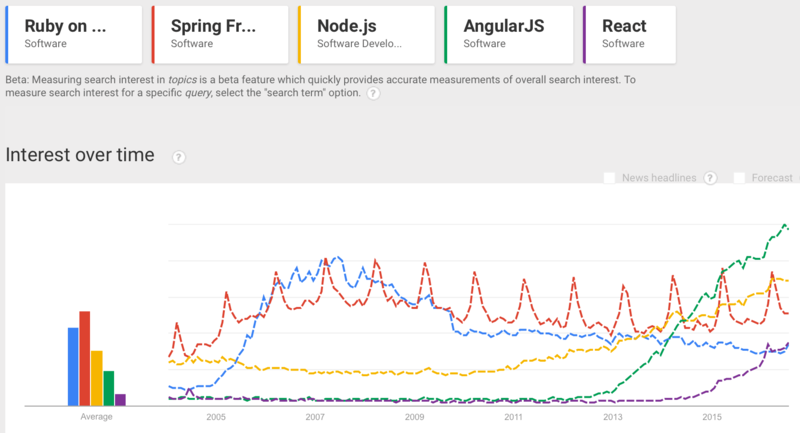 Node.js was announced in 2009? Meanwhile our in-house multi-currency e-commerce solution has grown to 45kloc, 2,100 tests and nearly 100 gem dependencies thanks to ever expanding integration with fraud detection services, fulfillment providers, payment gateways, email marketing solutions and an autodialer. Between daily business requirements we have been addressing technical debt by straggling to Ruby 2.2, Rails 4.2, RSpec 3.4 and ActiveAdmin 1.0.0.pre2. We have adopted CBRA and gemified the persistence core of the application. New gems adopted have included VCR, Wisper and React on Rails. On the tools side this year has seen widespread adoption of Slack for distributed teams, but we have stuck with Atlasssian HipChat, configuring integration with Airbrake for production exceptions, Assembla for tickets, BitBucket for code reviews, CodeShip for CI and Coveralls for test coverage. Increasingly global sales have raised expectations of operations to provide 24×7 uptime, monitored by PagerDuty and requiring MySQL hot backups. Why Docker? Because it promises to make dev-ops easier. Dockerizing an existing production environment is not trivial, moving development to Docker is perhaps a useful stepping stone. It might also make developer on-boarding easier but I haven’t tried that yet. Docker can be installed on OS X in various ways, most notably Docker Toolbox or homebrew. I was previously using docker-machine with Parallels but recently I discovered Dlite which simplifies using docker by creating a local OS X docker.sock that forwards requests to the docker VM. Dlite also sets up a an NFS server that exports /Users to the VM. Instead of VirtualBox or Parallels Dlite leverages a lightweight hypervisor called xhyve which requires Yosemite and hardware virtualization support (sysctl kern.hv_support). Note that as of writing Docker for Mac and Windows in public beta is using a similar approach. I can then cd to the project directory and bundle. Wednesday. Day 1. Keynote introduction by Jeremy Daer, nee Kemper, DHH thankfully racing. Heroku presenation on Kafka, Shopify presentations on shipit-engine, request_interceptor and BuildKite, Rafael França on Sprockets, and well attended presentation by Akira Matsuda with ideas for assorted Rails performance hacks. Closing keynote from Nickolas Means with a history of Lockheed’s original skunkworks. Thursday. Day 2. Ruby Heroes including Avdi Grimm, Charles Nutter, Akira Matsuda and Richard Schneeman. Surprisingly few vendor booths, including Indeed Prime, Hired, Skylight, RubyMine, Stitch Fix and Codacy. Rails 5 presentations on ActionCable, Turbolinks and Sean Griffin on miscellaneous enhancements. Richard Schneeman on maintaining Sprockets and David Copeland of Stitch Fix on emergent software architecture. Lightening talks on Scrivito, RocketJob, Appfolio Farcy, Railscamp, Bundler Gemstash, multi_zip, Brakeman, RubyBookClub, Reinteractive Wallaby and Benjamin Fleischer on JSONAPI. Friday. Day 3. Aaron Patterson, now at GitHub, workshops on Hashicorp tools and RedPotion and presentations on Percy and Sandi Metz on refactoring. Paul Lamere from Spotify with a wonderful presentation on music data analytics… in Python. P.S. I never guessed the most interesting presentation on Rails would be by Justin Searls. Rails 5 is almost upon us and we’ve spent the last two months, amongst other things, moving our 45,000 lines of Rails e-commerce code from 3.2 to 4.2. For better or worse the move has been less about embracing new features and more about compliance and maintaining security bug fix support. The move has been a rapid succession of stages, from 3.2 to 4.0 in development, 4.1 in production, and finally 4.2 in production. Overall it has been a significant effort and a learning experience. The biggest challenge we encountered was not fixing our 175 models and 40 controllers, but dealing with our nearly 100 open source gem dependencies. The project started from a proof of concept elegantly scaffolded with ActiveAdmin’s DSL and has accreted functionality and third party interfaces for the past four years. ActiveAdmin remains the leading Rails admin interface, but with the departure of Greg Bell momentum has slowed. Sean Linsley, Timo Schilling and others have put a significant amount of effort into answering questions and applying bug fixes, but the ambitious 1.0 milestone has remained unmet for two years, and gem releases have been infrequent. To update ActiveAdmin first we switched from stable 0.6 gems to the master branch in GitHub, replacing meta-search with ransack, then we worked our way down the master branch to 1.0.0.pre1 in 90 day increments, isolating and working around the issues that impacted us (#2233, #2679, #2771, #3038/#3324, #3145, #3147, #3486, #3591, #3776, #3784). Critical to this effort was our test suite coverage, which remains a disappointing, but so far adequate, 90% (and yes, we upgraded to RSpec 3.x as well). Apart from gem dependencies the most dramatic issue updating Rails was the breakage of non-strict mode used with our old MySQL database (and thus nearly everything). For Rails 4 we needed to configure ‘strict: false’ to ignore our true mode setting in the database, then with Rails 4.2 this changed again and we needed to explicitly set variable sql_mode to the required value. So what has Rails 4.x brought us? ActiveRecord foreign keys and enums, but we embraced the foreigner and enumerize gems long ago. Spring, but we so loved Zeus. secrets.yml but we already use environment variables and dotenv. Web Console, but we are happy with Better Errors and Pry. An improved cookie serializer that fouled up our ‘seamless’ rolling production upgrade. Autoloader vexation. Millisecond DateTime rounding errors (or is that due to OS X?). ActionMailer::Preview and ActionMailer#deliver_later, but we have already built out more sophisticated solutions. Strong parameters for sure. New bin/ scripts. Stricter routing with Patch. An end to ActiveRecord’s old dynamic finder API and tweaks to callbacks and ActiveRecord::Relation. Better performance, please, from Aaron’s AdequateRecord. ActiveJob as a wrapper for Resque or Sidekiq. ActiveSupport::Testing::TimeHelpers. Perhaps for us most importantly a step closer to greater concurrency with Puma (and LiveStreaming? ), Sidekiq, Celluloid, who knows? In year five with Rails I finally started contributing to high profile open source projects (ActiveAdmin, ActiveMerchant), albeit with mixed success. Understanding complex libraries written by others reacquainted me with debugging in RubyMine. In addition I published the first gems of my own using jeweler, taking my public GitHub contributions over 200 for the year. Working on OSS exposed me to Colloquy IRC and Travis CI. I contributed slightly more to StackOverflow and project related Google Groups. At my employer our ‘mature’ Rails codebase has grown from 20 to 30KLOC, monitored soberly by Coveralls (87%), CodeClimate (2.8), Codeship CI, Rubocop, Gemnasium and Bliss. I remain committed to SublimeText, now with GitGutter and SublimeGit, and to RSpec, influenced heavily by a RSpec workshop at RailsConf 2014. New gems adopted this year included (tentatively) interactors, oink and thor. Documentation has been mildly improved using YARD. Rarebit (creators of Sass and Haml) recently published the 2015 results of their annual Ruby survey, now in its seventh year. This year saw a significant shift to Ruby 2.2 (40%) following the shift to 2.1 last year (50%). Only about 15% of rubyists remain with Ruby 2.0 or below. JRuby adoption remains below 5%. For production the preferred web server remains Unicorn (40%) over Passenger (30%) though Puma adoption has reached 15% in its first year now that Rails 4 has better concurrency support. Copyright © 2019 Varyonic | Theme by SiteOrigin.